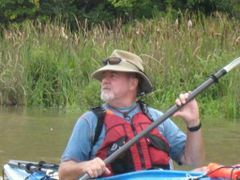 From Kayak Classes and Trips for Beginners! Respond by 6:00 PM on 4/21. PLEASE READ THIS ENTIRE ANNOUNCEMENT BEFORE SIGNING UP. Sam Fowlkes and Robin Pope are two of the best instructors in North America!! ONLY 10 SPOTS and class usually fills up fast so don't wait to long to secure your spot. Even if you have just started paddling but plan to paddle bigger white water in the future you should take this course!! If you paddle any where on moving water this is for you. I took this course the first year I got in a boat and have now taken it a total of 5 times with different instructors. This is not a white water paddling class. This is a safety class for you and your paddling buddies. What to do if you come out of your boat, how to wade across rapids to help someone or recover equipment, what do do if someone does get caught in a strainer or they get a foot entrapment. How to swim safely in moving water and much more. Trust me on this, ANYONE WHO PADDLES A KAYAK ON A RIVER needs this training. It will make you a much safer and confident paddler even though the course does not use boats! Warm regards to you all and I hope to see you on the river soon. Camping is on the property where the classes take place and is included in the price. Once you are checked in, NO COMMUTE! This is a special class that is offered to our members. It is designed to give you the tools to perform a safe and swift river rescue. Class location will be on the Tuckasegee River near Double Drop rapid. MANY MORE DETAILS WILL BE EMAILED TO YOU WHEN YOU SIGN UP! Due to the limited spaces in this course there is a strict refund policy in effect. Camping is available on site for no charge. (Camper Agreement Required). It is primitive camping, tent sites and a tepee, with porta john, warm weather shower (cold water) and a picnic shelter with electricity. See all events from Kayak Classes and Trips for Beginners!